Good job on the skeleton hands and tail! Congratulations! You have WON the Dark category in SaralynArati and LadySky's contest TOP DOLLS: Favorites! See contest wall for information on how to collect your 30 crowns! So freaking brilliant! I love how you did her tailfin bones, so creative and it looks perfect! Great background too! This is beautiful. I love the death edge to it, you can see the sadness in her eyes. Makes me want to go find the witch myself. Thank you, The_Nameless! I must confess, she's my darling - although she's a zombie and undead I love her and think of her as not evil, but unhappy, because she's cursed from a sea-witch. This is so dark, but so amazing! Everyone, just LOOK at those hands! Look at the bones! The blood and bruises over her, the stitched eye and mouth, the skeletal tail! 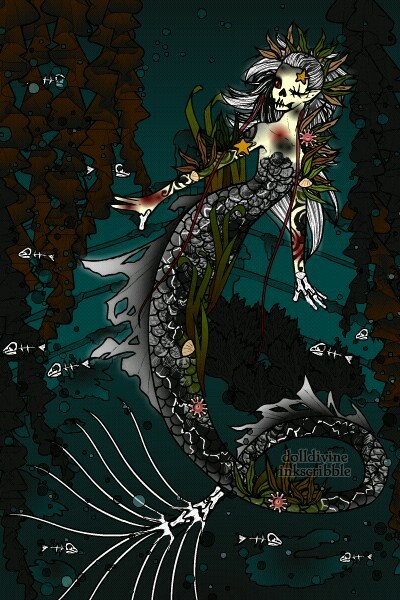 Do you see the barnicles and the sea life growing from her? She's rotting... This doll has such an amazing atmosphere to it. It's so amazing.